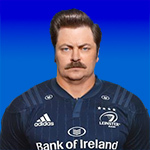 I'm booking my Irish trip in January and I notice that I can already buy my ticket for the match Leinster v Montpellier. Unfortunately, I don't understand how your stadium is actually working. I read that the 2 areas behind the goal are unreserved. Does it means that I won't have a seat number and the earlier I come, the best seat I can take ? Or wherever I'll be in the RDS, i'll get a seat ? Hope I made my topic understandable and somebody would be able to help me. ICI... ICI... C'EST MONTPELLIER !! You are correct, the areas behind the goal are unreserved and you can sit in any seat you find available. Any time I've been there, I like to go quite high up for the best view.